A.P.E. Controller 8100-0114 Configuration 10/25/01 | Welcome to A.P.E. Unit is set to run one ramp via foot pedal operation. additional ability to store 4 seperate ramp rates. The Auto Ramp “Mode 3” can store 4 adjusted ramp profiles. The unique feature with “mode 3” is its semi-automation. hitting the foot pedal also records the removal time. additional time required to complete the reinstallation. This additive is a variable that can be changed by the customer. 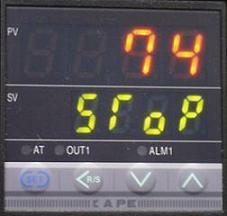 the unit automatically shuts off. The Ramp/Soak “Mode 4” features 4 Ramp/Soak profiles. Each profile can be set for 4 seperate Ramp/Soak segments. 8 Ramp/Soak Segments. This unit also features an autometed process. and walks away. The unit will shut down at the end of the process.